The VRNA-A200 Classic Safety Vest is a Class 2 illuminating safety vest with Vizlite Tape that Glows in the Dark. Available in Yellow and Orange, in Sizes M-4X. This third level of protection can be a life saver as you can now be seen in the dark without headlights for reflectivity or daylight for neon colors. This Classic Safety Vest glows without the use of batteries and is charged by daylight or artificial light. The features of this protect are 2.375" Vizlite DT Dual Technology Tape, 100% ANSI Polyester Mesh, Hook & Loop closure, 360° of Visibility and Printable Areas on Back and Front. Alpha garments feature our patented VizLite DT which offers 3 levels of protection of Fluorescence, Retro-reflectivity and Phosphorescence. 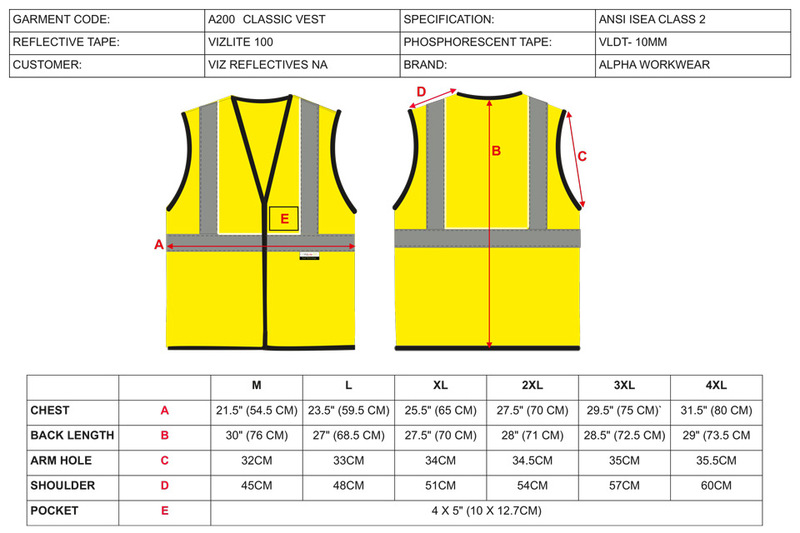 Have purchased some of these vests for crews operating at our silica sand mining site. These are great for night shift crews engaged in all activities; but also for crews going underground during all hours of the day. The VizLite technology illuminates us better than we all imagined. Will purchase more of these. We purchased a small order of these vests to try them out. So far, all the guys wearing them seem to like them. The illumination strips show up really well in the dark. Will likely be purchasing more of these.